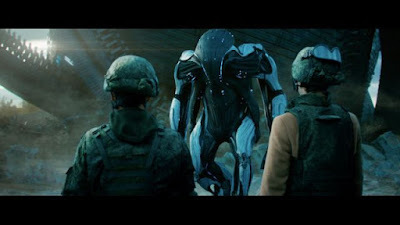 Fedor Bondarchuk's epic IMAX science fiction film disappoints. Damaged by a meteor storm and brought down by Russian fighters an alien spacecraft crashes into moscow. As the military quarantine the area a group of young adults, including the daughter of the head of the military go into the restricted area and explore. As the military tries to figure out what to do and contain the situation the explorers contact he alien. Soapy film degenerates into a romance between earthling and alien, a father daughter drama, and humans aren't so bad after all parable- all of which we've seen about a thousand times. This all might have worked had the film not tried to be so epic in scope. Filmed to fill an IMAX frame everything is shot to look expansive, even the small human moments. Its a nice idea but the drama gets lost in the empty spaces of the screen. While far from a bad film, it is dramatically unremarkable and there isn't enough here to sustain an over two hour film despite some visually amazing sequences. Worth a look if you run across it on TV but I really can't recommend paying t see it on the big screen which is where the visuals will really impress.